We’d love your help. Let us know what’s wrong with this preview of Army Girl Steals Civilian's Heart by Oswald Pereira. Oscar P Amrita Datta is petite and pretty, with large light brown eyes. But she calls herself an Army Girl, because of her army background. Her father and his two brothers were army officers, inspired by an uncle who almost became army general when Jawaharlal Nehru was Prime Minister. Marrying army officers is a tradition in both her father and mother’s side of the family. Oswald Pereira, a veteran journalist, is the author of the hugely popular novels, The Newsroom Mafia, Chaddi Buddies and The Krishna-Christ Connexion. His two other novels are the critically acclaimed Revenge of the Naked Princess and Golmaal In Goa. Army Girl Steals Civilian’s Heart is his sixth novel. Oswald has worked in senior editorial positions for leading newspapers and magazines like The Times of India, Financial Express and Outlook. An English language trainer, he has taught journalism at The Times School of Journalism. He was among the founding team of Outlook magazine. To ask other readers questions about Army Girl Steals Civilian's Heart, please sign up. Army Girl Steals Civilian's Heart by Oswald Periara, an romantic fiction. The story is well judge able from its title and blurb. The story says the love story of Army Girl and Civilian boy falling in love with each other. Amrita is an intelligent and independent with strong army background from Delhi. When she joined at Mumbai Newstime, a leading newspaper in all over India as trainee she meets Oscar a famous news reporter slowly they falls for eachother during her training time they both become Army Girl Steals Civilian's Heart by Oswald Periara, an romantic fiction. The story is well judge able from its title and blurb. The story says the love story of Army Girl and Civilian boy falling in love with each other. Amrita is an intelligent and independent with strong army background from Delhi. When she joined at Mumbai Newstime, a leading newspaper in all over India as trainee she meets Oscar a famous news reporter slowly they falls for eachother during her training time they both become inseperable and story is about what happens to their love after she moves to Delhi. Will their parents accept Oscar an non civilian? What are all the hardships this young couple faces is the remaining part of story. It is an predictable story but the way author carries the story with stating little emotions and feelings of them makes story interesting and it makes me to read till last. The facts that author took front is acceptable like family heritage of marrying their children to only army personnels and Hindus in Amrita's family and marrying their child to only Christians in Oscar's family. The story little bit remembers me of Chetan Bhagat's 2 states novel because of the similar concepts. Other than that all are well written, typos are negligible. Narration is from Oscar's point of view and also makes you to sense journalist works. Our protagonist, Oscar is a lucky lad to have found his love for life! Cupid has a tendency to strike when we least expect him to. Oscar isn't keen on dating neither does he have a thought for marriage or for love because he is too busy toiling in his job as a reporter at the Mumbai edition of Newstime that he has to keep his thoughts on a leash and has to prioritise his job first and foremost. But as I have already said, he is a lucky lad, he does find a chance at love when our leading lady, Am Our protagonist, Oscar is a lucky lad to have found his love for life! Cupid has a tendency to strike when we least expect him to. Oscar isn't keen on dating neither does he have a thought for marriage or for love because he is too busy toiling in his job as a reporter at the Mumbai edition of Newstime that he has to keep his thoughts on a leash and has to prioritise his job first and foremost. But as I have already said, he is a lucky lad, he does find a chance at love when our leading lady, Amrita, who joins as a trainee, breezes into the company and also into his life. But, like other love tales, this one has its hurdles too. Army Girl Steals Civilian's Heart lets you look at love through rose-tinted glasses and offers a happily ever after for the fairy tale fanatics. It's a simple mushy-gushy love story. Don't be mislead by the title because as the title reads, Amrita is not an Army Girl but yes, she does hail from an Army Family and with this comes strict restrictions for her. The plotline revolves around this duo and how they find their happily ever after despite the challenges that are thrown their way to separate them from each other. Army Girl Steals Civilian's Heart tells the story of two people Oscar and Amrita, who are entitled to contrasting family background; Oscar who is a Civilian and Amrita who have been accustomed to the strict Army life. Oscar is an optimistic person who is always on the lookout for new opportunities while Amrita is a well-behaved and well-mannered girl who lives under a set of strict principles set by her Army Family. Where marrying an Army is set as a tradition in Amrita's family, how she ends up with the staunch Christian, Oscar is the main question in the book and as the storyline progresses, this question gets answered eventually. How they tackles with the religious and familial traditions is for you to find. The author has tried to capture the emotions and he did accomplish and the language was also very simple and intelligible. The narration was also good. There were instances when I stumbled across incorrectly structured sentences and some grammatical errors. If edited once more, these mistakes can be corrected. Also, how Amrita falls for Oscar isn't described in clear words, instead that part is written almost hastily that the narration has skipped over this very part. I felt the blurb could have been shortened a bit since, it gives away the heart of the plot and the concept on which the story is based. The title could have been a catchier one, it's long and umm...doesn't sound that interesting. Same goes for the cover; it is bland and doesn't really give an idea of what could conspire between the pages. The plot was somewhat clichéd and have in use plenty of times and the ending was also a predictable one. Overall this is a good book but this just wasn't of my type. I am not usually the type to like typical love stories. But there are plenty of people out there who loves to read simplistic love tales; this one would be the right fit for them. The title of the book ' Army Girl Steals Civilian's Heart ' though a little long, it gives the reader a hint it's gonna be a love story and always a love story is beautiful! The book cover is nice and colorful animated one. The big heart on the cover page is what catches one's attention. The plot is a simple yet sweet love story that is entangled between two people coming from different culture and professional backgrounds. The journey of their love story right from the point of falling for each other till standing for each other is very well scripted. The readers can identify themselves in the plot and thus can become a part of the plot. The author is successful in getting the readers glued to the book. Though a predictable plot, it's a good book. All the characters are very well scripted. The narration is nice and interesting. "Army Girl Steals Civilian's Heart" by Oswald Pereira is beautiful, realistic and a little predictable story! The plot revolves around the protagonist Oscar Pereira who happens to be a civilian, working for a newspaper agency to be precise and Amrita Datta, belonging to an army background with her father and brothers serving in Indian Army. The author has wonderfully depicted the practical and actual journey of two lovers belonging to different religious beliefs, economic and social status as well "Army Girl Steals Civilian's Heart" by Oswald Pereira is beautiful, realistic and a little predictable story! The author has wonderfully depicted the practical and actual journey of two lovers belonging to different religious beliefs, economic and social status as well as cultures. The book brought out the diversity of different cultures and religions in open among the readers with deep emotions expressed vividly and explicitly. The narration of the book was gripping and engrossing with great selection of vocabulary. However, the storyline seemed a little expected and forseeable with a happily ever after! I found the cover simply mediocre and blurb too revealing. The suspense and drama of the plot was ineffectively concealed. The title was fine nevertheless a bit misleading providing the impression that Amrita was an army girl. Army girl steals civilian's heart is a romance novel. The plot revolves around the protagonist Oscar Pereira who works for a newspaper agency and Amrita Datta, belonging to an army background with her father and brothers serving in Indian Army. Her family always had problems with the civilians but still, she falls for one and at last convinced her parents to agree to her choice. This novel is really fast paced as if the author was trying to complete it in a hurry. I failed to connect with the characters and even the plot. It was so poorly written and the dialogues between characters were not related with each other, or the characters, or the plot. From the first page, I got bored of reading it as it was not kind of a novel who can keep a reader hooked up. army girl steal civilian heart by Oswald Pereira . the title seems so indulging .the cover is good . as a defense brat or I would say navy brat I loved the book . here is the short review. This is a very light-hearted romantic novelette which takes the reader up and down through different emotions. Truly, Amrita and Oscar belong to different worlds, but their love helped them create a unique world of their own. The love musings are nothing new, but the innovative narration makes it sound refreshi army girl steal civilian heart by Oswald Pereira . This is a very light-hearted romantic novelette which takes the reader up and down through different emotions. Truly, Amrita and Oscar belong to different worlds, but their love helped them create a unique world of their own. The love musings are nothing new, but the innovative narration makes it sound refreshing and delightful. the language of the book is simple. The word army inculcates something like to sober up, which seems to many like making life “so serious,” as if seriousness precluded joy, warmth, spontaneity and fun. But there can be a delusional, blind quality to non-sober festivities. To have our eyes open soberly with all our senses and memory intact allows some of the most rewarding, soul-nourishing, and long-lasting pleasures possible. Does this mean that Seriousness is too boring to the playful human condition? A heart of stone that has a long face can never express love? The title gives us a perfect backdrop of the story; something intense- but yet cute. The author has no doubt has beautifully proven the point that highly sensitive people are too often perceived as weaklings or damaged goods. To feel intensely is not a symptom of weakness; it is the trademark of the truly alive and compassionate. It is not the empathy who is broken; it is society that has become dysfunctional and emotionally disabled. There is no shame in expressing your authentic feelings. Those who are at times described as being a 'hot mess' or having 'too many issues' are the very fabric of what keeps the dream alive for a more caring, humane world. Never be ashamed to let your tears shine a light in this world. I also loved the way he projected love from both “army” and a “civilian’s” point of view. And finally I really loved the way the author has brought out the theme of love in this plot. When a writer falls in love with you - their very soul bursts open like a supernova brightly lighting up everything in its way. They will write spells on your skin and carve your name onto their bones and make you theirs. turns in to a masterpiece as your life's aim and goal looks you are taken over and over away by one showering in you as a rain of one and only one. That’s love- irrespective of an army girl or a simple civilian. Overall I would like to rate the book 41 on a scale of 50. The novel is one of my first Kindle version so far. The experience with Kindle format was great, as the novel was a light read and I was able to finish this novel in about 3 days. The novel attracted me due to its title- An army girl steals civilian’s heart. I am an army fan and going by that craze I finished this novel quite soon. The story is a romantic fiction between an Army girl and a civilian news reporter. At first, I was misled by the title thinking about the soldier posted falling in lo The novel is one of my first Kindle version so far. The experience with Kindle format was great, as the novel was a light read and I was able to finish this novel in about 3 days. The novel attracted me due to its title- An army girl steals civilian’s heart. I am an army fan and going by that craze I finished this novel quite soon. The story is a romantic fiction between an Army girl and a civilian news reporter. At first, I was misled by the title thinking about the soldier posted falling in love with a civilian. But, soon I realized that it was about Amrita Datta, whose family had been servicing the nation for ages protecting the Tricolour. The internship brings her closer to Oswald, who was a usual reporter drowning in alcohol. The story describes the insecurities of a civilian family, a defense background and a girl madly deeply in love with a guy out of her religion, not even caste. Yes, those were the times when all of this religion, caste and all were quite a big deal. Unlike, now where everyone is free to set-up their opinion and marry anyone they wish to. “Civilians, never trust civilians” – This statement by Amrita’s mother enraged me, but yes the world is still quite different. A line of control still residing between defense forces and civilian world. “And it was too early in their relationship to be called love” – This fascinating lines at the beginning of the unusual love story. It would make you believe in the power of love, where sometimes it sounded like “2 States” by Chetan Bhagat. But, the story line has its own charm where Amrita’s aunt helps in getting the situation under control. "Army Girl Steals Civilian's Heart" by Oswald Pereira published by Oswald Pereira Publication in 2017, 1st Edition a book of 162 pages priced at Rs. 120 and available only as e-book on Kindle as of now. The story of this book seem to be very close to the kind of character set up originally in Authors life. This book is about a very light hearted love story where complications seem to be too much initially but with time and conditions complications just vanished. This is a very happy go lucky kind of love story, tense situations did arrive in the story sometimes but the bond between Oscar and Amrita, the male lead and the female lead of the story, was so strong that they came out with flying colours. Oscar Pereira is a reporter at Newstimes, to be specific a very good reporter, Roman Catholic based in Thane and has a big family which includes 6 siblings and parents living in a small house altogether. Amrita Datta, punjabi girl having Punjabi Hindu father and Sikh Mom from Delhi, joins Newstimes as a trainee. Her entire family history is such that she has a strong army background and therefore she proudly calls herself Army Girl. They both fall in love, Oscar is a heavy drinker but because of Amrita he leaves his drinking habit therefore she becomes angel for Oscar mother. With little agitation initially but later on she accepted Amrita whole heartedly. Same with Amrita's family, initially with negative response then after meeting Osace and knowing about him things turned out to be totally positive. Overall a good fiction love story, easy going and well composed. The title itself is self explanatory .This is a story that starts with an investigative crime journalist Oscar Pereira, falling in love with a young intern Amrita .Amrita though hailing from an illustrious and rich Army background is petite and gentle but a determined young girl.She too falls for the charms of the tall and handsome and rugged senior journalist. But their backgrounds and religions are big obstacles in the path of love Add to it - Oscar has a dark secret ! What will the army girl A The title itself is self explanatory .This is a story that starts with an investigative crime journalist Oscar Pereira, falling in love with a young intern Amrita .Amrita though hailing from an illustrious and rich Army background is petite and gentle but a determined young girl.She too falls for the charms of the tall and handsome and rugged senior journalist. But their backgrounds and religions are big obstacles in the path of love Add to it - Oscar has a dark secret ! What will the army girl Amrita do when she discovers Oscar's dark secret ? Will their love bear fruit? These are some of the questions that will be answered when you read this book . The author is a seasoned writer , who himself was a journalist . In fact there is a striking resemblance with the main character Oscar Pereira who bears the similar name, and religion and is also an investigative journalist ,if you might not have noticed . He brings to us the urgency and bonhomie of the printing business which is interesting .He also gives us fully fleshed out characters whom you can visualise and narrate to.The story is predictable in some places but manages to hold the interest till the end .The story also has elements of humour interspersed throughout . Though Mr. Pereira is a superb narrator ,I wish this book would have been snipped a bit and made slicker.The book ended abruptly like an unfinished business leaving me a bit disappointed or maybe some scope for a second part ! Also I wish Amrita was shown a little more feisty and not just in bed . About the Author : Oswald Pereira, a veteran journalist, is the author of the hugely popular novels, The Newsroom Mafia, Chaddi Buddies and The Krishna-Christ Connexion. His two other novels are the critically acclaimed Revenge of the Naked Princess and Golmaal In Goa. Army Girl Steals Civilian’s Heart is his sixth novel. Oswald has worked in senior editorial positions for leading newspapers and magazines like The Times of India,Financial Express and Outlook. An English language trainer, he has taught journalism at The Times School of Journalism. He was among the founding team of Outlook magazine. PRAISE FOR THE AUTHOR The Speaking Tree, a Times of India publication: Oswald Pereira has a manner – that only a few good writers have – of making a tale so thoroughly readable. Spoiler free Plot : The Alcoholic investigative newspaper journalist Oscar Pereira meets Amrita a north Indian trainee from Delhi and is charmed by her.Even if charmed Oscar maintains his cold behavior for a while until Amrita accompanies him to cover one of the events happening in Mumbai and there starts the real story. Amrita has a strong Civilian bashing army background in her family.She has all her life been listening to the glories of her family serving the Army. The Army family detested the civilians totally for no justifiable reason other than they being the civilians.Oscar has huge family he grew up with in Mumbai, His two brothers,Sister-in-laws, a father from whom he seems to have inherited the alcohol problem and His very religious Roman Catholic mother. Amrita and Oscar fall in love with each other but the journey ahead isn’t a cake walk. Amrita comes to know of his excessive alcohol problem from a colleague,The Roman Catholic mother, A staunch Army family who dislike this civilian make the life and ride of these lovers bumpy. It is interesting to read how and what happens in the story ahead. What did not work for me : I wish the first few chapters that ran with express speed has detailing and one could enjoy the romance more before problems kicked off, and also over all detailing of the few important scenes and chapters was missing at times while unnecessary characters and details could be avoided. This book, in particular, has all the traits to engage you in an amazing tale of love and positive vibes. Starting this book made me skeptical of how the story would build up. but believe me, this book will not disappoint you and will leave you all smiling and content. Oscar and Amrita are one hell of a couple and they hit it very well. I was intrigued and captivated with the progress of the story, and it builds up gradually into a grand one. The characters are amazingly crafted and as if they exist in real life. The book is funny witty and has moments to cherish. we are in a progressive world and breaking barriers of religion and culture is bound to happen and is happening. kudos Oswald Pereira I will jump onto your next book as soon as it gets published. keep up the good work and keep intact the humor. worth 4 stars and all the praises you deserve .. This is my first novel by the Oswald Pereira. He has fantastically written the novel. Plot and the characters of the novel are well placed and perfectly portrait. The author has displayed the problems of a young couple which are bind with religious restrictions and traditions. The story is perfectly narrated as a third person. The story revolves around Amrita and Oscar. Amrita belongs to a family of colonels and army generals who has lived in a nuclear family. Whereas, Oscar belongs to a joint f This is my first novel by the Oswald Pereira. He has fantastically written the novel. Plot and the characters of the novel are well placed and perfectly portrait. The author has displayed the problems of a young couple which are bind with religious restrictions and traditions. The story is perfectly narrated as a third person. The story revolves around Amrita and Oscar. Amrita belongs to a family of colonels and army generals who has lived in a nuclear family. Whereas, Oscar belongs to a joint family. Amirta has been to Mumbai for her training in journalism. And Oscar is a journalist in the same newspaper where Amrita has to complete her training. They fall for each other, and are in love. The couple decides to get married and the problems of a common couple begin. The families of both Amrita and Oscar are against them. Both being from a different religion and traditions. Will they succeed? Will they be able to convince their parents about their marriage? Author being a journalism background, his work also displays the same. Worth a read. I really liked it. Am looking forward to read his other works as well. The cover is well designed, simple yet beautiful. The title seems interesting & is apt with the story. Theme is of unconditional love, despite of all the difficulties that a person might face in their lives, how they endure & overcome it no matter what life may throw at them. The book consists of various elements like love, pain, vivid emotions, packed details which makes us engrossed into it completely. Story is bit typical on the inside out, yet it has a refreshing touch thanks to the aut The cover is well designed, simple yet beautiful. Story is bit typical on the inside out, yet it has a refreshing touch thanks to the author who wrote it well. usually when people are in love, they face a lot of difficulties in their life though things may be impecunious at first but things do work out at the end eventually. Characters are well described, emotional touch is what makes the book successful in every possible way, a must buy I must say. The language is exquisite, planned & well written. Narration has a good touch, flawless & kept in sync with the book completely. Before sharing the review of the book, I am sharing the reason why I chose to read this book. I instantly fell in love with the title of the book. I had heard of various stories where girls had fallen in love with army men but I was always keen to know the other way round story. And I finally found a book that I was looking for. This is a simple love story that revolved around Oscar and Amrita. The male protagonist is very good reporter, a Catholic who lives in a huge joint family. The female pro Before sharing the review of the book, I am sharing the reason why I chose to read this book. I instantly fell in love with the title of the book. I had heard of various stories where girls had fallen in love with army men but I was always keen to know the other way round story. And I finally found a book that I was looking for. This is a simple love story that revolved around Oscar and Amrita. The male protagonist is very good reporter, a Catholic who lives in a huge joint family. The female protagonist is a Punjabi has army men in her family and feels proud in calling herself as an Army Girl. Destiny had its plans and Amrita joins the same company where Oscar worked as a reporter. Their meeting and eventually falling in love seemed to be planned in the heavens. Though there were some problems and confusions but they happen in every love story. These problems are the ones that make the love story a better one for a perfect ending. There were problems in convincing both the families as religion was a bar but the two protagonists won the heart of each other’s families. For Amrita it was easy as she made Oscar leave his bad habit that he had been continuing for a long time. And in case of Oscar, he took time to win the hearts as the first response was expected to be a negative one. I don’t know whether I had made too many expectations from the story after reading the title or was the story not that good. It was predictable most of the times as it happen in every love story where the lovers are from different cultural backgrounds. Since there were no mystery and dramatic twist and turns, I did not like the book that much. Otherwise it was a light and a decent read. Recommended for lovers of romance genre! 'Army Girl Steals Civilian's Heart' by Oswald Pereira has a longish title that I did not much care about, but it was precisely this that made me want to read it. For you see, I too am an army girl, coming from a Punjabi Army family. The older generation were all in the army, so I could relate to some of the army perceptions about civilian life that have been talked about in the book. That was so typical, and so funny -- at times. I thought love stories were meant to have some terrible heartbreaki 'Army Girl Steals Civilian's Heart' by Oswald Pereira has a longish title that I did not much care about, but it was precisely this that made me want to read it. For you see, I too am an army girl, coming from a Punjabi Army family. The older generation were all in the army, so I could relate to some of the army perceptions about civilian life that have been talked about in the book. That was so typical, and so funny -- at times. I thought love stories were meant to have some terrible heartbreaking dramas as their central theme, but this book wasn't melodramatic. And that is precisely why it was more realistic than some of the other books that I have read of this genre. The book is witty, funny and takes life, but not love, lightly. It is meant for the urban elite and it are those emotions that are being written about here. It's a nice, fun read and I recommend it as a perfect way to spend a leisurely Sunday. Go for it -- especially if you come from an army background. This review has been hidden because it contains spoilers. To view it, click here. This is a very light-hearted romantic novelette which takes the reader up and down through different emotions. Truly, Amrita and Oscar belongs to different worlds, but their love helped them create an unique world of their own. The love musings are nothing new, but the innovative narration makes it sound refreshing and delightful. I loved the way the author has handled the emotions of the characters and presented it to the reader. Simple, mundane things also felt like a whole new experience. At This is a very light-hearted romantic novelette which takes the reader up and down through different emotions. Truly, Amrita and Oscar belongs to different worlds, but their love helped them create an unique world of their own. The love musings are nothing new, but the innovative narration makes it sound refreshing and delightful. I loved the way the author has handled the emotions of the characters and presented it to the reader. Simple, mundane things also felt like a whole new experience. At places I felt that the narration could have been a little more descriptive or illustrative, but still I loved the balance throughout. The plot, the characters and everything was like watching a real life incident with real characters. Overall, it was an amazing afternoon read, and I thouroughly enjoyed the book. I would like to reccomend it to my fellow readers as well. Amrita Datta and Oscar Pereira are as different as chalk and cheese. She is an army officer daughter having loads of money. He is also from an erstwhile landowner family; but they were ruined due to drinking. She is an intern in the newspaper where he is a seasoned reporter. She is a Love in the time of communal tension and ghar vapsi. Its like fighting a herculean battle. Though the book is printed in 2017 period seems old. But the issue is evergreen. Inter religion marriages are always tricky. Oswald Pereira has a typical love story in the novel “Army Girl Steals Civilian’s Heart”. However, sometimes typical love stories can still engage the readers as to what will happen next. The suspense of the ending, the journey of the couple, their experiences with the parents and relatives on the either side, their own clash of personalities, all these make every love story interesting. One minor point that I found a bit irritating was the use of same word within the paragraph ie. repetition of certain words and somewhere even a the same line repeated again and again throughout the novel. This needs a bit of editing. When I heard about the title "Army Girl Steals Civilian's Heart", I found it a bit bizarre from the terms army girl and civilian heart. But I started reading the tale I only surmised that these are perfect terms to describe it wonderfully. Revolving around the love between two hearts, the two young reporters, taking culture, tradition and restrictions, must say, this tale is perfectly penned. A painful glimpse of two striving young hearts is focused on. The characterisation is not bad though the p When I heard about the title "Army Girl Steals Civilian's Heart", I found it a bit bizarre from the terms army girl and civilian heart. But I started reading the tale I only surmised that these are perfect terms to describe it wonderfully. The characterisation is not bad though the plot was quite predictable. Bestowing some mystery and suspense in the story could have been kinda better. Here’s a beautiful interesting story of amrita, a girl from strong army family who joint as a trainee in newspaper and then she mate with the guy, a reporter then they fall in love with each other. Now the question is how they tackle the future problems? Will their parents accept their relation? Story is simple predictable yet interesting one. One light read it is. Blurb reveals much information. Title is interesting. Cover is cute one. Story narration is beautiful and gripping one made me glued Here’s a beautiful interesting story of amrita, a girl from strong army family who joint as a trainee in newspaper and then she mate with the guy, a reporter then they fall in love with each other. Now the question is how they tackle the future problems? Will their parents accept their relation? Story is simple predictable yet interesting one. One light read it is. Blurb reveals much information. Title is interesting. Cover is cute one. Story narration is beautiful and gripping one made me glued to the last. Here are situations described and characters portrayed well enough. Overall nice reading simple love story. "Army girl steals civilian's heart " Title is self explanatory. Book cover is also accompanying the title. It's a amazing love story of two persons Amrita and Oscar who belong to different religion, culture and above all different manners. The story is described in a realistic manner that at the end of every chapter you will be excited to know what will happen next? Some may find vocab problem but on the whole it is understood according to context and fitted appropriately. 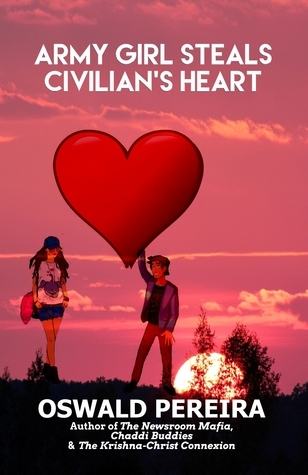 Enjoyed reading this rom "Army girl steals civilian's heart " Title is self explanatory. Book cover is also accompanying the title. The story is a medium paced love story of Oscar Pereira, a civilian and Amrita Datta , an army child. Nothing very impressive about the story ,the usual cliche love story. They meet at Newstime , get to know each other , fall in love. The story then paces over in a typical way,where the couple faces difficulties in making their parents agree for the marriage and also problems in each other’s nature. The second half is basically their struggle to make their parent’s agree for their marriage. For m The story is a medium paced love story of Oscar Pereira, a civilian and Amrita Datta , an army child. Nothing very impressive about the story ,the usual cliche love story. They meet at Newstime , get to know each other , fall in love. The story then paces over in a typical way,where the couple faces difficulties in making their parents agree for the marriage and also problems in each other’s nature. The second half is basically their struggle to make their parent’s agree for their marriage. A simple love story where the boy and girl are from different cultures.the story starts with them meeting at the work place, falling in love,knowing each other more,convincing their parents for their marriage,and finally getting approval.People from different backgrounds need not sacrifice their lives, love instead put more efforts and have faith in love.And I wish everyone had a maasiji like the girl in the story had.I won't reveal it why, read the book and get to know that.Happy reading. So basically this book begins in the newsroom of Newstimes (a newspaper company) in Mumbai with the girl entering in her beautiful attire and the guy getting mesmerized by the angel ( this happens, but eventually). It takes us on a journey of Oswald Pereira( the civilian journalist ) and Amrita ( the new trainee whos an army girl). There is this underlying feeling in defence families that civilians have and will always be different from them, (mannerisms , and the right behavior for society is the dividing factor). They consider there mini world of defence to be the beginning and the end .The writer has captured these emotion and factors beautifully( I can vouch for it as I have been a witness to it). It doesn’t take them a lot of time , to fall for each other on the various mini dates they go for . Many months of attraction and catching each others glances comes to an end when Oscar calls Amrita for his birthday party (she’s the only one invited).I believe that sometimes two people just have a connection, and you don’t need many chance encounters to realise it . But being the Indian society this was the easy part . As you might have deciphered from the names Oscar is a Roman Catholic and Amrita is Punjabi. Though I have to say the writer did not stretch on the parents part , and yes it was hard to convince them but these two kids did a fantastic job in that department. And I believe the religion part was handled very well. The book has an amazing collection of words ( so keeping a dictionary is advised). Though it did at times faltered with the story line The love story felt real , as it even concentrated on their jobs and its decision and not only them stealing glances. Though I believe more could be written for the development of their love for each other( it wasn’t a love at first encounter , but when they did see each they both were taken by the other person). It was a light read and I believe a lot of it was predictable. The writer could have got something new on the table , something different. Because at the end of the day all the love stories are same , its just their journey which makes them unique. It just felt that love came easily to them ( but is love ever easy to come ?). So all in all I felt that the book was an easy read , and I would like to try a few more books by this author. Though I feel this authors romance is not my cup of tea . This book is for everyone out there who loves someone who doesn’t belong to the same social setting , so read it , as it will definitely give you courage . The book cover is an animated one reminds me of Anime series I used to watch. The big heart on the cover page is what caught my attention, it gives the reader a hint it’s gonna be a love story and always a love story is beautiful! Hello! Like I mentioned in my earlier book review, I miss writing a full-fledged review for each book I read yet I managed to pen down for my latest read! A simple love story where the boy and girl belong to different religions. Like most love stories this one too blossomed at the workplace ( a Silent prayer that none of my work colleagues is reading this LOL) the story starts with a usual admission of a newcomer who is attractive and intriguing enough for the existing ones. A new face always does that! This is my first novel by the Oswald Pereira. The plot revolves around the protagonist Oscar Pereira a Mumbaikar who happens to be a civilian, working for a leading newspaper and Amrita Datta, from Delhi belonging to an army background. Inter-caste/religion love affairs are the talk of the town, I have too many couples around whose love stories passed out with flying colours and almost all of them belong to different religions. Hence, lately this is becoming popular everywhere because Love is traditional and also a fool, one would end up loving someone who wouldn’t be easily marriageable by norms, because it’s human nature it gets attracted towards things which are hard to get, being told not to go near and not to open that door! Because the Author has suggested the book to be semi-autobiographical beforehand I assumed it won’t have lot of fictional twists, which was true. This is a signal for the reader – to enjoy it as a true account type of fiction and not to expect wild twists in the plot. The writer is a veteran journalist, he has a way with the words. Although the theme has already been written about before, the author manages to hold the interest of the reader by his attention to detail and splashes of humour. I liked the way the author has handled simple, mundane things – the plot, the characters and everything were like watching a real life incident. Though, at certain places I felt that the narration could have been a little more descriptive or illustrative, like Amrita’s big brown eyes and its repetition was just fine it didn’t allow me to imagine the face as brown eyes are something we come across every other day, (in my case every day because half of the people I know are brown eyed) And, the bare shoulders through sleeveless tops!! I still cannot understand that, either the top had to be off-shoulder one or the Author is yet to learn the description of women apparels because there’s no way one can see shoulders in a sleeveless top!. The author has wonderfully depicted the practical and actual journey of two lovers belonging to different religious beliefs, economic and social status as well as cultures. The book brought out the diversity of different cultures and religions in open among the readers with deep emotions expressed vividly and explicitly. I would like to add that it was an amazing afternoon read. With lucid narration and exemplary vocabulary, the book will impress voracious readers. Predictable plot, as the blurb gives out too many details. The title of the story is ambiguous; the word’ army’ in the title can mislead the readers into believing Amrita as an Army woman. I did not like the underdevelopment of characters; it was difficult to associate and empathize with them. The grammatically incorrect title with missing articles could have been made shorter and more precise. Repetition of certain words could have been avoided. I am the author of eight books, including six novels -- The Newsroom Mafia, Revenge of the Naked Princess, Chaddi Buddies, The Krishna-Christ Connexion, Golmaal In Goa and Army Girl Steals Civilian's Heart -- a self-help book How to Create Miracles in Our Daily Life and a book on true crime stories, Crime Patrol: The Most Thrilling Stories, co-authored with TV Superstar Annup Sonii. My romance with I am the author of eight books, including six novels -- The Newsroom Mafia, Revenge of the Naked Princess, Chaddi Buddies, The Krishna-Christ Connexion, Golmaal In Goa and Army Girl Steals Civilian's Heart -- a self-help book How to Create Miracles in Our Daily Life and a book on true crime stories, Crime Patrol: The Most Thrilling Stories, co-authored with TV Superstar Annup Sonii. My romance with books began in my early teens. But the first books I read were surprisingly not mushy romances or silly detective novels, but the great literary classics and 'heavy' books on philosophy, psychology and self-improvement. I began reading thrillers and paperbacks much later in life. I always wanted to be a writer, but since publishing works of fiction was so difficult in a country like India, I chose what I thought was the second best option -- becoming a journalist.I have more than 30 years’ experience in journalism and communications.